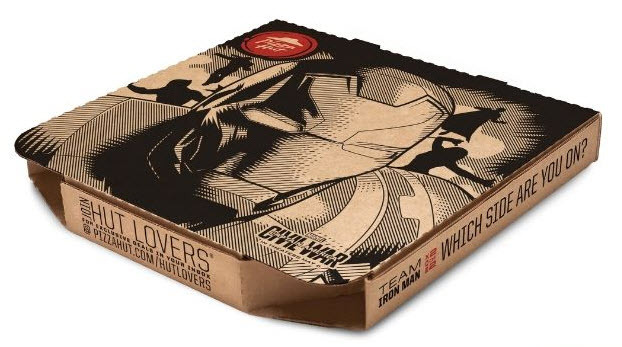 Pizza Hut has a packaging tie-in with the upcoming film, Captain America: Civil War, which arrives in theaters on May 6th. 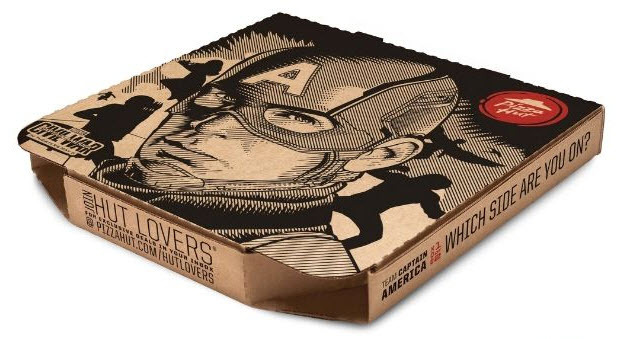 The pizza restaurant chain is serving its pizzas in Iron Man and Captain America boxes. Pizza Hut has also launched a digital hub with content from the film. They will also be running television spots featuring footage from the movie. The company says prizes and experiences will also be offered. Jared Drinkwater, Vice President of Marketing, Pizza Hut, says in the announcement, "Being able to provide our customers with unique content exclusively through our channels is one of the many exciting ways we are bringing this effort to life," added Drinkwater. "A wide variety of prizes and unique experiences tied directly to the film will be fun and entertaining for Marvel and Pizza Hut fans alike." The Pizza Hut Captain America: Civil War site can be found here.